Organic Avocado Oil, Cannabis Concentrate, Cannabis Terpenes. We have transitioned to avocado oil from coconut oil for even further improved health benefits and higher bio-availability. Avocado also contains a high supply of healthy and desirable mono-unsaturated fatty acids and poly-unsaturated fatty acids with a whopping 13% Omega-6 composition, a profile that has been shown to help support wellness. Avocado oil is not just a carrier oil, it is one of the powerful active ingredients. Other tincture mediums are known to suffer from separation and have a high potential for microbial growth, and some are just plain unhealthy to consume. 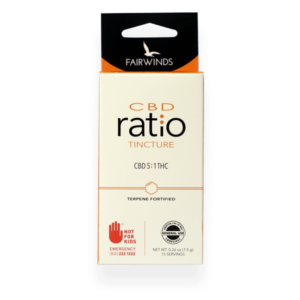 Fairwinds tinctures are formulated with an emphasis on purity and quality, are shelf stable, anti-microbial by design and the medium itself provides wellness support. With a soft, smooth & non-oily feeling, avocado oil provides a clean, natural & rich experience. – Start by gently squeezing the dropper at the top of the glass tube. – Gently remove the dropper from the glass container and measure out to .6ml by using the graduated lines. – Place the glass dropper directly under the tongue and squeeze the rubber top to release the serving of oil. Wait approximately 30-60 seconds for oil to fully absorb. – Full effects of the product can be expected within 10-30 minutes after the initial serving is administered. – Continue to administer more tincture as necessary to meet needs for personal circumstance. When administering a second serving, be sure to allow the oil to absorb in between servings. [Pro Tip] When sublingually absorbing cannabis oil, the body will naturally absorb each serving with ease when there is less carrier oil.